If figures are anything to indicate then one thing is crystal clear that the Pakistan Army has perhaps got the orders, to begin with, a genocide in Balochistan to suppress the genuine demands of the locals for a better living environment. 18 killed and 77 disappeared in just a month of January 2019! Balochistan is the largest province consisting of the South West of Pakistan and accounts for almost half of the land mass of Pakistan but just 3.6% of the total population of the country. It is surrounded by Afghanistan and Iran in the west and by the Arabian Sea to its south. Immensely rich in natural resources, including oil, gas, copper and gold it has been the major source of revenue for Pakistan but despite this huge natural wealth, the area is one of the poorest and neglected regions of Pakistan with majority of its population living in deplorable housing conditions where they don’t have access to electricity or clean drinking water. The accession of Balochistan to Pakistan, as known to the world, happened under the shadows of Pakistan army and their guns, as Khan of Kalat, had decided against the accession. It was on March 26, 1948, that Muhammad Ali Jinnah ordered the Pakistan Army to move into the Baloch coastal region of Pasni, Jiwani, and Turbat. It was a clear act of aggression by the Pakistani military detachment and Kalat capitulated on March 27 after the army moved into the coastal region and it was announced in Karachi that the Khan of Kalat has agreed to merge his state with Pakistan, of course against the wishes of Khan. Jinnah accepted this accession under the gun. So, the Balochistan which was an independent entity prior to the division of India survived for precisely 227 days before being forcibly merged with Pakistan. Incidentally, during this period of 227 days, Baluchistan had an embassy in Karachi with its own flag flying where its ambassador to Pakistan lived. Ever since then protests against the illegal and forced annexation of their country have been a routine affair in Balochistan with the most noticeable one being the killing of Sardar Akber Bugti and 26 of his tribesmen by the Pakistan Army in 2006. Arrests, torture, killings, and disappearances became a routine affair. As a rough estimate, almost 6000 people are still missing beside thousands killed. The New Year 2019, has nothing good stored either for the Balochs like the previous years. 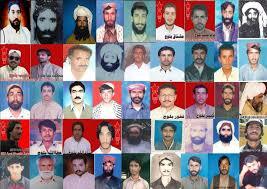 The Pakistan Army has the blood of 18 innocents Baloch in just one month and is responsible for 77 disappearances. What is most appalling is the recent recovery of 10 highly decomposed bodies which were brought by Edhi foundation to Teramil Graveyard in Dasht for burial on January 08th, 2019. Burial of these bodies without DNA test have caused obvious anguish to the families of disappeared victims, as they will never come to know whether their kins are alive or dead. It is a different thing that families still remain on hunger strike in front of Quetta Press Club for the return of unknowns. The figure of 18 and 77 may be just the tip of the iceberg as even today 26 districts of Balochistan still remain inaccessible due to the media blockade by Pakistan Army and nothing much is known about these places. Media gag is to keep the atrocities under wrap and suppress the voices raised against the violations committed by the forces. With ever-increasing protests in the province, it is imperative for the Imran Khan to control the rogue Pakistani Army at the earliest in their spree of killing innocents. Thereafter he must address the demands of locals to ameliorate their grievances. Unless that is done nothing is going to stop the volcano to erupt and if that happens it may jeopardize the entire country.